Buthylaldehyde is a 4-carbon aldehyde which is used for the processes of organic syntheses for the production of n-butanol, 2-ethylhexanol, 2-Ethylhexanoic acid, trimethylolpropane, and polyvinyl buthylal. Butyraldehyde is used as an intermediate catalyst for manufacturing of alcohols, paints and lacquers and plant protection pesticides among others. It is also used as an intermediate to manufacture pharmaceuticals, agrochemicals, antioxidants, textile auxiliaries, perfumery, flavors and other types of additives. N-butyraldehyde is used as a primary raw material in production of alcohols, acids, amines and esters. In addition it is key raw material for the production of films used in safety glass. The largest end-users of butyraldehyde are companies that manufacture rubber accelerators, synthetic resins, plasticizers, solvents and other high molecular weight polymers. This report identifies the global Butyraldehyde market size in for the year 2014-2016, and forecast of the same for year 2021. It also highlights the potential growth opportunities in the coming years, while also reviewing the market drivers, restraints, growth indicators, challenges, market dynamics, competitive landscape, and other key aspects with respect to global Butyraldehyde market. 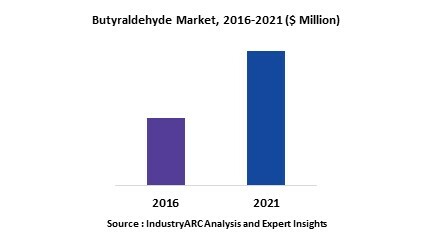 Geographically increasing North America is dominating the market for butyraldehyde. Low cost labour and government’s support for industrialization in developing countries of Asia Pacific are estimated to drive the growth in this region. Asia-Pacific is estimated to witness the highest growth during the forecast period and to hold the highest share in butyraldehyde market.